One crucial aspect of the story of newly minted Nobel laureate Nakamura Shuji, whom the immigration bureaus and media outlets of Japan and the U.S. are fighting over (Link) is being ignored, possibly because it is truly MADE IN JAPAN. 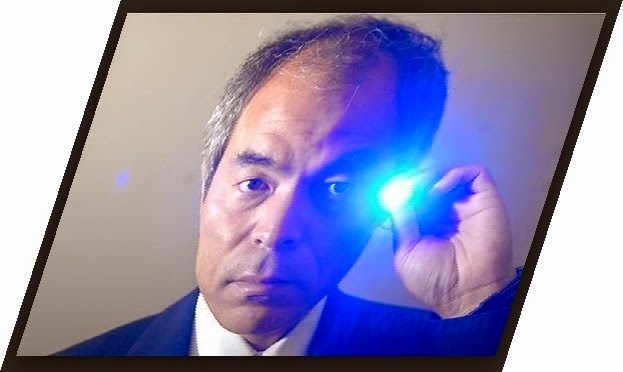 While everyone remembers the lawsuit Nakamura filed against his former employer Nichia demanding a reasonable share of the revenues the company accrued from the blue diode he developed for them (Link) no one is recalling the most telling detail of the story: Nichia executives ordered Nakamura FOR YEARS to cease and desist in his quest for the blue diode. Nichia could not, due to the extreme protections afforded by Japanese labor laws and out of concern for its reputation, actually fire its insubordinate researcher. Any other company anywhere else would have sent such an employee out the door, pronto. Nakamura could, however, pursue his dream at Nichia's expense. Nichia eventually reaped windfall profits from Nakamura's work, which the company stubbornly but not inexplicably was unwilling to share. After all Nichia had been forced into into years of bankrolling not only Nakamura's salary but his lab. In the current discussion of the pressing necessity to reform Japan's labor laws (I remember one conference where a British finance industry analyst made reform into a sexual identity issue, baying out, "When is Japan going to man up and attack labor law reform?") advocates should be asked to concede the immense social and financial benefits that resulted from at least one Japanese company's inability to fire a rebel. Interesting... I had somehow missed the detail (or perhaps it was not mentioned in public reports) that the company had been trying to fire him. Puts the later lawsuit in a different perspective. The managers did not necessarily want to fire Nakamura. They just wanted him to stop using his company position to pursue what seemed to them a fruitless line of research, one which taxed the company's research budget and talent. His response was to ignore orders.